Living in the District of Calamity (sic), I watched coverage of the Navy Yard shooting in which twelve NAVSEA workers were killed as well as the gunman with rapt attention, because this violence both terrorizes the Nation's Capitol and because I know people working in that building. 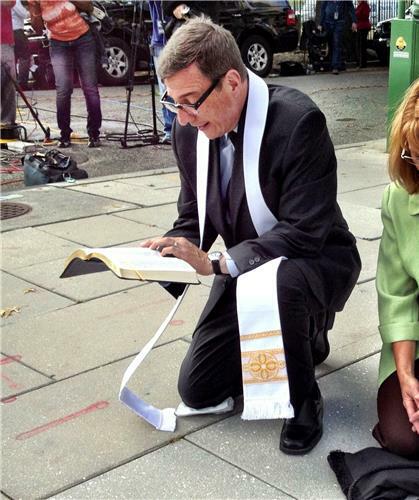 While the low flying helicopters which circled the Navy Yard while the shooting situation was active was remarkable, the image that really struck me was of an evangelical minister praying on the sidewalk near the Navy Yard. WTOP reported that Rev. Rob Schenck lived in the Navy Yard neighborhood and was preparing to fly out of town when he heard the news of the shooting when he turned around to minister to those who were wounded and frightened. As Schenck told Bob Madigan "At times like this you ask yourself what can you do? 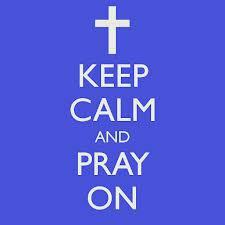 As a minister what I do is pray." Another memory occurred while the media was waiting for the initial press conference from law enforcement, a priest walked nearby. When St. Vincent de Paul Catholic Church Pastor Fr. Andrew Royal passed nearby the media scrum, he asked if he could help. Royal also offered comfort and prayers for those in shock, but he thought it important to also conduct the noon liturgy. I join people of all faiths, across our community in praying for the people killed and wounded in the attack on the Navy Yard in Washington, D.C.. I also pray for the family members of the victims, as well as the first responders and emergency workers at the scene. While many facts are now still unknown, our most powerful tool right now is prayer. The Church always calls us to prayer, particularly in moments of crisis. It is what we do best because it is what the Lord asks us to do. Cardinal Wuerl's message, along with the on scene ministering by Rev. Schenck and Fr. Royal highlights the importance of allowing ministers access to mass casualty situations.